Our little shark Fajita has grown like a weed. Probably because I fix him up a big shrimp cocktail every other night. Christina always says it looks like I am giving the shrimp a dip in a hot tub, to bad I follow it up with slicing the shrimp in pieces. Loses the relaxing vibe, eh? I finally have Fajita eating straight from my hands, which will come in handy once he is over three feet. I still usually use an extension rod to feed him, since I am quite partial to my fingers. In fact, at the beginning, he got a little rowdy and took a nip at me. Please disregard our awesome basement complete with lots of 2×4’s and little boy racecar curtains. 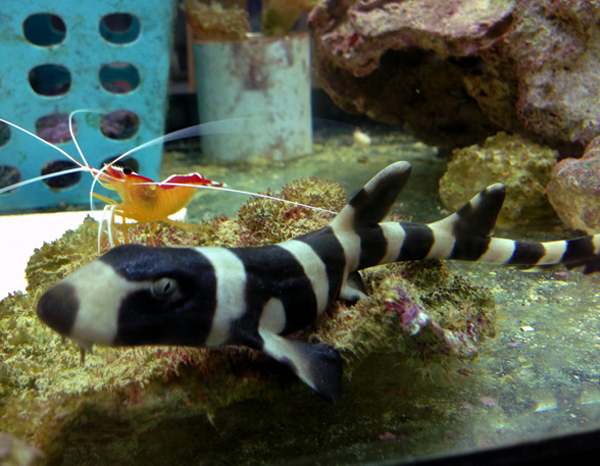 See how our shrimp is hitching a ride on the shark? Bet ya didn’t know he is actually picking his brethren out of Fajita’s gills to get a late night snack. You little cannibal you. How long do you think before I lose a finger? Think a shrimp fajita sounds tasty? Want to buy some racecar curtains? How long IS he? He looks big! And how many tanks do you have?? Hahaha….he is probably six inches now. Maybe a little longer. We “technically” have four tanks and a sump (a sump is all of your filtration so it is like a tank but not pretty AT ALL hahaha). We have the big one in the dining room, my small nano in the office, the shark/clown fish/frag tank, and then our “fingers crossed” baby clown fish tank which will hopefully get some use sometime soon! We are planning a post about our basement setup….but it is a little lengthy so it keeps getting put off! I didn’t realize you had all of that. Sweet! Fajita almost looks cute… I mean, for a shark. So when the shark is 4ft long,, what are you gonna feed it?! Surely shrimp won’t do for long..